Your first dance song has to be unforgettable. 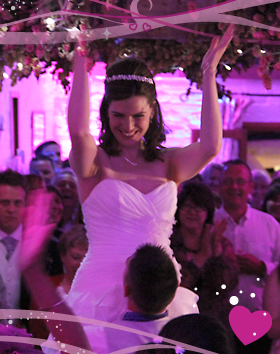 When it comes to your big day, one of the moments you will never forget is your first dance. So choosing that perfect track to symbolise your and your partner’s union, has to be absolutely perfect. You can picture the conversations for years to come: “And what was your first dance song?”. If you don’t have an obvious choice it can be a bit overwhelming trying to find one, let’s face it, there are plenty of options out there. Luckily I found this blog post by those lovely people at Arena Event Hire who have listed no less than 100 different choices. All with a full description and a video so you can listen to them. You can view the article here. The article covers a wide range of musical genres and we found that there should be something for everyone. And a word of warning – couples may have to set an evening aside for this task: It’s highly addictive. Viewing and listening to all 100 will take quite some time. I would love you to leave a comment below and let me know your favourites from the list. And once you’ve chosen your important first dance, then you need t think about the perfect dance floor to perform on. 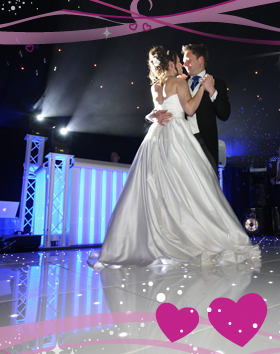 Take a look at my LED Starlit sparkly dance floors, for the ultimate stunning first dance experience. Or how about dancing on clouds – literally. Shallow clouds of dry ice swirling round your feet at you dance your first dance as husband and wife. Nice post. I came across this one as well which gives some more good advice about choosing a first dance.